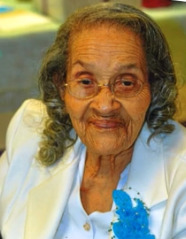 Mrs. Lillie Lucas Knight, 100, of 400 Pike Street, Apt 104-I, Wilson, NC, passed away on April 9, 2019 at her home. The funeral arrangements are scheduled for Saturday, April 20, 2019 at 1:00 pm at L N Forbes OFWB Tabernacle, 1800 Lane Street Ext., Wilson, NC. Bishop Elect Ernestine McGee will deliver the eulogy. Burial will follow in Rest Haven Cemetery, Lane Street, Ext., Wilson, NC. A public visitation will be held on Friday, April 19, 2019 from 3:00 pm until 6:00 pm at Stevens Funeral Home, 1820 Martin Luther King, Jr. Parkway, Wilson, NC. Mrs. Knight was preceded in death by her husband, Joseph Knight; her children, Joseph, Knight, Jr., Florence Knight, Delores Knight, Shirley Knight and Christine Dickerson; her siblings, Addie Winstead, James Lucas, Ella Bethea, Nanny Finch and Willie Lucas. She leaves cherished memories to: six daughters, Mary Lee Knight, Magdalene Knight and Charlene Knight Harris (Charles) all of Wilson, NC, Lillian Fauntroy of Bowie, MD, Jocylen Patterson of Knightdale, NC and Eudale Knight of New Mexico; 73 grandchildren, great grandchildren and great great grandchildren including, Randy Knight (Kim), Kim Parker and Michael D. Knight; one brother Herman, Lucas of Wilson, NC; a host of nieces, nephews, cousins, other relatives and friends. The family will receive friends at the home where they will assemble on Saturday at 12:00 noon in preparation for the funeral procession.